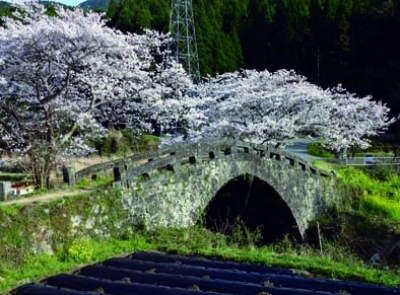 Okubo Bridge is an arched stone bridge over Tsuru River, a branch river of Midori River. It was built to connect to Okubo village in the south of Tsuru River. The bridge was built in a flat area that its arch makes a slight hill. The curve matches with the mountains in the back. This arched bridge makes it easier to receive the water pressure when the water level becomes high. It was built under a leadership of the head of Tomochi district, Shinohara Zenbei, in 1849. At the foot of the bridge is a stone monument saying "No car is allowed on this bridge." On the monument, there are also names of people who donated for the construction such as Jiemon, Denhachi, and the stonemason for this bridge, Shinsuke. This bridge has been loved so much by local people that in Showa, people avoided using this bridge with heavy stuff in order not to damage the bridge. All year round, you can see beautiful views of this bridge and the surrounding landscape, especially in the season of cherry blossoms. The bridge is 21.0 meters long, 2.7 meters wide, and 6 meters high. It is designated as a City's Cultural Property.